iMD Health is Canada’s leading technology innovator providing a digital, interactive, educational approach to the examination/counseling rooms of Family Physicians, Specialists, Nurses and Pharmacists to provide the latest health information to patients “At The Point of Care”®. “We are excited to be partnering with iMD Health to make their award winning platform available to all of our users of the Medevision software. Our primary users are clinic and hospital-based physicians. They have to interact and educate their patients and/or families very quickly. By making iMD available within Medevision, we are arming our users with two best-in-class solutions, driving more value and saving time” says Dr. Robert Horvath, Emergency Physician and president/founder of Medevision. “This partnership is very exciting for both organizations. It combines the work flow/scheduling platform that Doctors need with leading education that Patients need. Our iMD solutions are used across Canada by over 1,900 Professionals, delivering over 700,000 patient education sessions per month. Working with Medevision, we are now expanding access of iMD to several thousand more Doctors, and impacting the health literacy and understanding of medical conditions to many more Canadians”, says Kevin Delano, President & CEO of iMD Health Global. “We look forward to working with Medevision to assist their Doctor in the care of their patients”. assignments for any medical department. With Medevision, healthcare and administrative staff can now easily find and contact any scheduled physician of any department when needed. The system is cloud-based and incredibly easy to use. User access is via a browser, smartphone, tablet, or any other mobile device. Medevision integrates schedules from any number of departments across one or more facilities. iMD Health Global is a Canadian based healthcare software development company, based in Toronto. Since 2010, iMD has grown into Canada’s largest and most innovative digital patient education platform. Winning many awards in Canada and on the global stage, iMD has arrived as the best-in-class solution. iMD offers it’s platform to healthcare professionals (Doctors, Nurses and Pharmacists) “At The Point of Care” ® (Doctor clinic, Hospitals, Pharmacy’s and Home Healthcare). 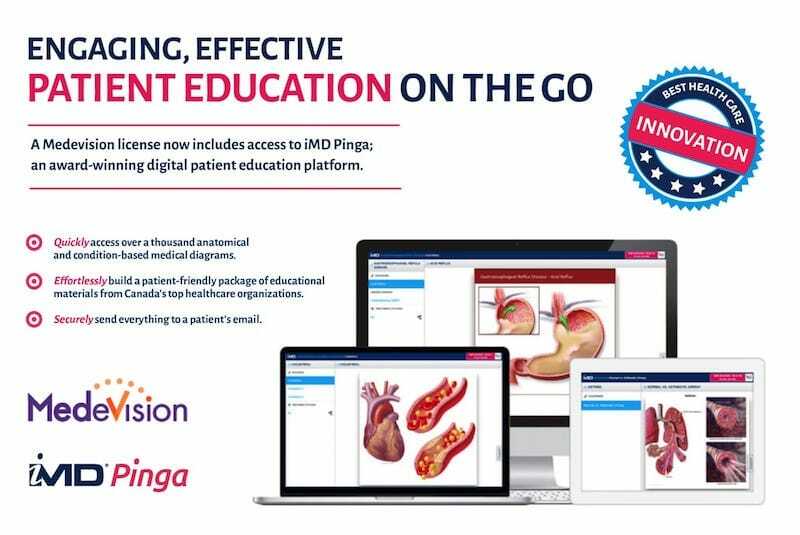 iMD is a cloud-based patient education platform that allows healthcare professionals to bring their patient session to life through seamless integration of professionally – vetted diagrams, brochures and videos on over 1,500 + conditions, anatomical categories and treatment options. All content is print and email enabled, to provide to the patients at home, so to increase their level of understanding, retention – improving their adherence to treatment plans.